Does anyone read Tom Degan? Take a look, put him on your list. He lives in Orange County, upstate. Some days he just goes and sits with FDR for the day. I'll probably go sit with the Methodists and play cards this afternoon. The inclusive Methodists. 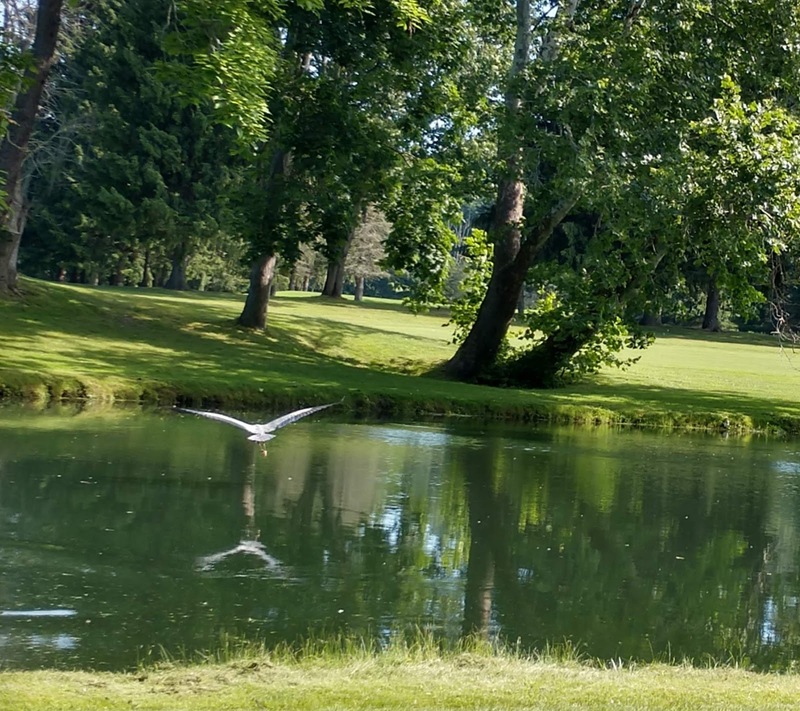 We had places to go, things to do this morning, and passed our heron friend again. 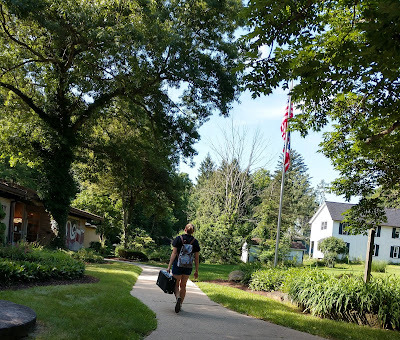 He gave us little more than his back, and crossed the pond. In the spring I saw him head to the rookery with a fish, and assumed he was feeding a family. But here he is again, alone. I must read up on the habits of herons! I left Laura at the library for her Tuesday/Thursday stint with children and book club. She has a trumpet gig today. And I stopped at the post office to mail dish towels. And tea towels. Tomato, tomatoe. How small is my town, you wonder. This is Linnette, the boss of the stamps. She says they are charged with selling stamps, and she's made herself first in charge. She used a metered sticker for the difference between postage due and a sheet of national park stamps. 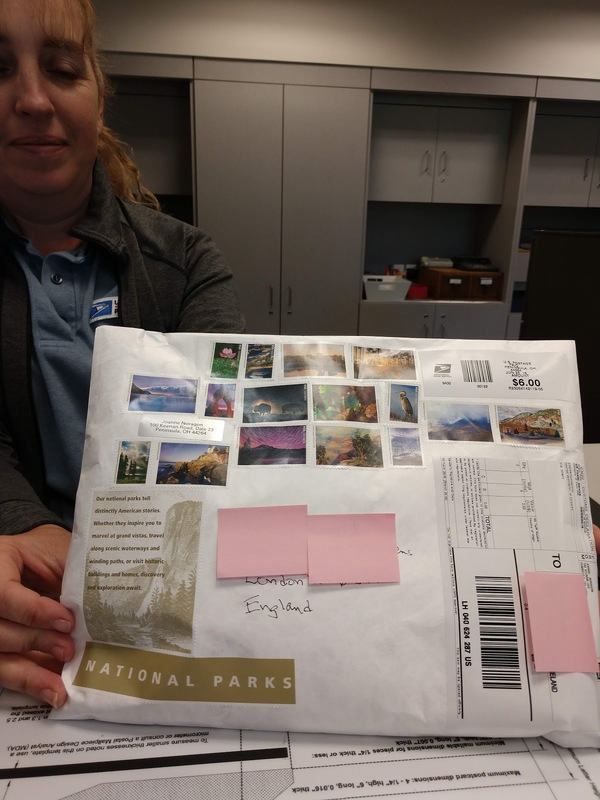 Then she put national park stamps all over the envelope, And put on the National Park information from the center of the sheet AND cut out and put on the National Park name of the sheet. We have mailed the first envelope of tea towels. Here's what I'm up to, and the rules. I copied my blog list to a spread sheet. I hope to send a couple of towels to every name on it. That will take a while. My blog list is as old as my blog. We know some blog names are now empty shells. I'll go by sadly, unless I've become acquainted with a child. Some are old, old friends we still check up on. Put up your hand if you remember Graham, One Stoned Crow. If I don't have it, I'll ask for your address when I'm there on the list. If you don't want to divulge it, I am not offended, and will go quietly by. Finally, from the lesson last time. Nothing is to come back. Pass it on, if you have a burning desire to reciprocate. I live an uncluttered life in under a thousand square feet. So, if you are happy, pass it on. Dear Joanne, the photos today are beautiful. The heron shots are great too. Someone in England is going to be very happy soon. I knew Graham of One Stoned Crow. Do you happen to know what happened to him? I've missed his posts so much. the last posts I remember were of him building his house north of where he was living. Some small backstory. For 25 years Greg had a small velvet monkey, Stoffel. Stoffel died about four years ago, and Greg quit posting. He lives in South Africa, is a talented wildlife and landscape photographer, and knowledgeable historian of the last fifty years of Africa. Although he does not post, he answers the comments still being left on his last blog. I put a link to Graham's site. Oh I didn't know his real name was Greg and I didn't know he answered comments. I did know about Stoffel. It's Graham. My brain does that flip thing often. The packages are as lovely as I'm sure the towels are. Linnette is a good boss of stamps. Such a wonderful gesture Joanne! This is such a lovely, generous thing to do, Joanne. You are spreading good feelings across the world. I so admire your industriousness and attitude! We should all take a leaf out of your book and pass hapiness around like a piece of warm carrot cake. You are making the world a better place with your tea towels! A generous thing to do -- may Athena, Goddess of Weaving, speed your loom! As I so often say, your tea towels are lovely. And much used chez us. when I was in charge of buying stamps, I always got the pretty ones. I loved using them. 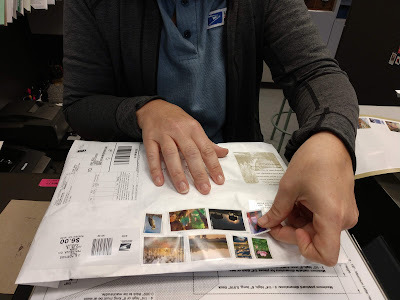 Marc who now has mail and post office duty just buys a sheet of the forever stamps. boring. you are a generous soul Joanne and I'm so happy to have you in my circle. paying it forward works. Oh Joanne, you relly are a dear. 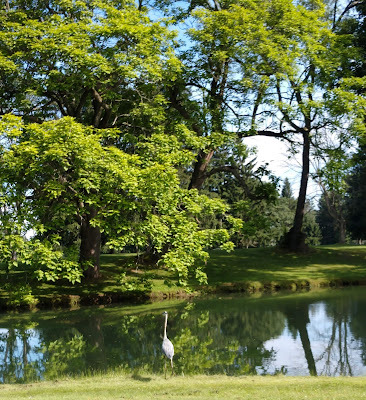 So green there and such lovely pictures of the heron! I think its neat Laura is helping out at the library this summer! I'm sure it is really appreciated! Your towels are amazing. Ought to be used in the center of the table rather than towel. You are a remarkable person in this space and time, so glad I found you. We have herons up here, they live in a reserve a few blocks down by the bay. They look small in the tall tree nests but when they land right infront of your shoes , my GAWD they are huge! I don't know anything about herons, I don't think we have them out here. What a good person you are Joanne. That's quite a collection of stamps. I like Laura walking off with her trumpet. I always feel blessed when I see a heron. They are such beautiful birds. Your generosity and spreading friendship with your lovely towels is so kind. The world needs more Joannes. Love you Joanne. They have Mister Rogers stamps out now, but my post office keeps running out. Don't know if I'll get any, but he'd be very happy about what all you do. Mr Rogers stamps were out so darn quick here, too! I doubt I'll get my hands on any, but that's OK. I have my memories of watching him on TV when I was wee. A wonderful life in under 1000 Square feet. I have 1100. PS: Could I be added to your list? She asks humbly. There's a street in Amsterdam with a daily fish market running down the middle and every roof has a heron on it, just waiting to swoop and clear up at closing time. Fat herons, too! 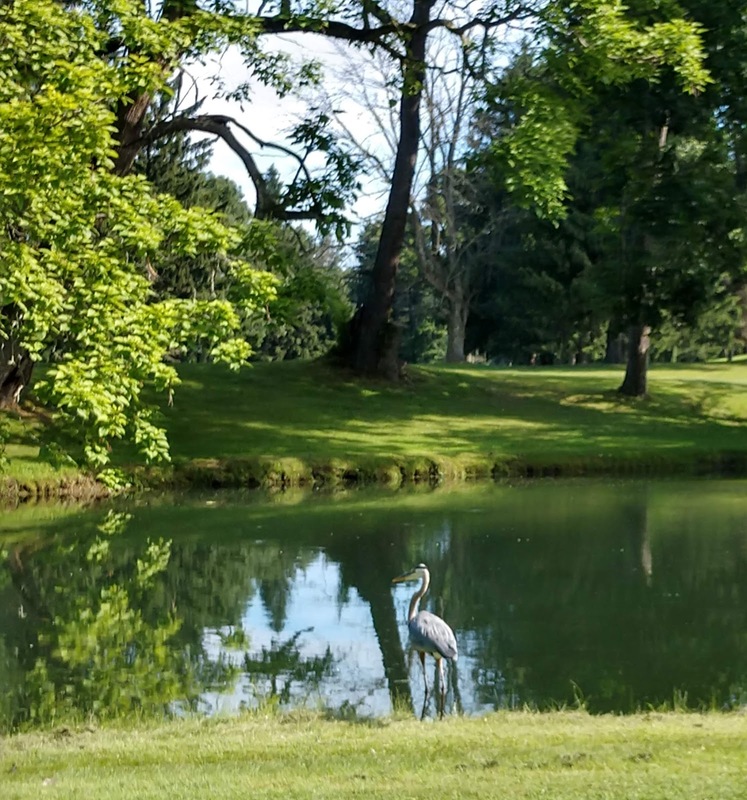 There are some herons living close by here as well. Awesome pictures! I love herons. We've some in Golden Gate Park I see regularly. Summer in your town looks lovely, btw. The stamps on the package to England look many and varied. Love your blog to of course!